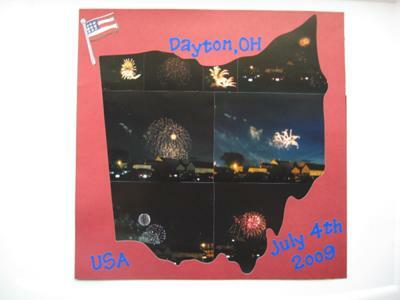 I cut out "Ohio" using the fit to page option and layered my photos behind the template. Although this is one of my simplier layouts, it has great meaning. This evening and the act of sitting down to scrapbook these pictures felt like a little piece of freedom after a horrific start to 2009. (a serious car accident, a death in the family, and the death of our dog) Getting together with my family to watch the fireworks was the start of my healing process and helped me see that everything was going to be ok.
Return to July 2011 Scrapbooking Layouts Contest.